James Cosmo is a prolific Scottish actor, who performs in film and television productions since the late 1960s. Cosmo was born in Clydebank, Scotland, the son of actor James Copeland. A staple of British television, with credits in hundreds of television shows, Cosmo made a name for himself playing Scottish "tough guy" characters. 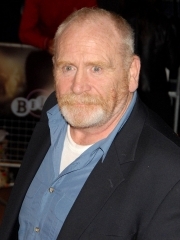 Outside of Britain, he is best known for his film roles as Angus MacLeod in Highlander, Campbell in Braveheart and as Father Christmas in the adaptation of The Chronicles of Narnia: The Lion, the Witch and the Wardrobe. Over the years he has also had roles in films such as Trainspotting, The Last Legion, Troy, and 2081. He also appeared in Take the High Road as Alex Geddes from 1982-83. Cosmo is married to a spouse named Annie and has two sons named Findlay and Ethan. He is a ardent supporter of the football club Rangers FC and has attended several official functions at Ibrox. Whole or part of the information contained in this card come from the Wikipedia article "James Cosmo", licensed under CC-BY-SA full list of contributors here.